Tuesday Political Mix: Obamacare Official In The Batter's Box : It's All Politics The 2014 mid-term elections right now look like they could be a battle over the shutdown and Obamacare... a federal judge stopped parts of a Texas abortion law that would have decreased access to the procedure... Ohio's GOP Gov. Kasich defies his party to defend the social safety net for the poor. 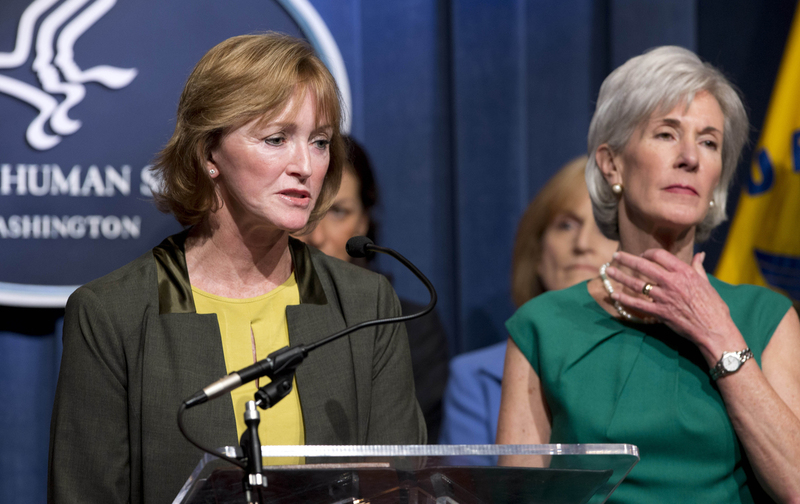 Health and Human Services Secretary Kathleen Sebelius, (who we're sure was not intentionally making the "choke" sign) and Marilyn Tavenner, head of the HHS agency that oversaw the Obamacare website project. Good Tuesday morning, fellow political junkies. As you go through your day, keep this in mind: at least you're not Marilyn Tavenner. When critics of the Obama administration's botched launch of the Affordable Care Act call for heads to metaphorically roll, Tavenner, the top official of the Health and Human Services agency that oversaw the ill-fated website project, is high on that list. She will be the first senior Obama administration official to testify before Congress since the botched Oct. 1 startup of the Obamacare website. The only person likely to have a worse time of it this week on Capitol Hill is HHS Secretary Kathleen Sebelius, due to testify Wednesday before Congress. With the World Series in full swing, in the language of baseball Tavenner is the first administration official up at bat. But unlike actual baseball, lawmakers not only get to pitch her high and tight fastballs, they also get to call balls and strikes. With that, here are some of the more interesting pieces and tidbits of political news, analysis and reflection that caught my eye this morning. The government shutdown and wobbly launch of the Affordable Care Act website now look like the ground the 2014 mid-term campaigns will be fought on, writes Politico's Alex Isenstadt. Of course, all that could change by next summer. The Obama administration knew years ago that millions of Americans wouldn't be able to keep health insurance coverage they liked, even as President Obama promised that they would, NBC News' Lisa Myers and Hannah Rappleye reported. A federal judge stopped parts of a Texas anti-abortion law that would have restricted access to abortions to many women by raising requirements for providers, reports Christy Hoppe in the Dallas Morning News. The ruling can expected to fire up both sides in the abortion debate in Texas, where it is already figuring prominently in the 2014 governor's race, and beyond. With congressional budget negotiations as the backdrop, Lawrence Summers, the former Treasury secretary and Obama advisor, channeled his inner Alexander Hamilton, telling Morning Edition co-host Steve Inskeep the national debt is an "asset" that can be used to invest in the nation's future growth. Republican Ohio Gov. John Kasich has become a contrarian in his own party when it comes to the importance of the social safety net for the poor, the New York Times' Trip Gabriel reports. Kasich recently defied his state's Republican legislature and took Obamacare-related funding to expand his state's Medicaid program. Democrat Terry McAuliffe has expanded his lead over Republican Ken Cucinelli a double-digit lead on Republican Ken Cuccinelli, the Washington Post's Laura Vozella and Peyton M. Craighill report. McAuliffe's momentum increases the chance that Democrats could sweep all state-wide races. President Obama is scheduled to attend a McAuliffe rally Sunday to help boost turnout, especially of minorities and young voters, in a traditionally lower-turnout off-year election. Graphics based on research by Bloomberg Businessweek's Eric Chemi help us visualize the states where House Republicans are likely to be most vulnerable because of the narrowness of their 2012 margins of victory. The odds are still against the Democrats regaining control of the House, writes Andrew Gelman in the Monkey Cage blog on the Washington Post site. The meaning of all the conspiracy theories and of the assassination of John F. Kennedy himself 50 years ago occupy the musings of Adam Gopnik in the New Yorker. He concludes that assassination exposed just how near America's light and dark sides are to each other.